Go all in—heart, soul, mind, and strength—at Gardner-Webb University! Our campus is nestled in the foothills of the Blue Ridge Mountains within the quaint community of Boiling Springs, North Carolina. Nearby uptown Shelby offers restaurants, businesses, and historical sites to explore. Less than an hour away is the active sports scene of Charlotte, the unique charm of Asheville, or the outdoor amenities and cultural opportunities available in Upstate South Carolina. GWU is home to 22 NCAA Division I sports, where our Bulldogs compete on a national level, with recent basketball program victories over Nebraska, Clemson, and Purdue. We also offer more than 20 intramural sports for the student body to enjoy. As you explore the wide range of educational opportunities at your fingertips, you may wonder what makes one college different from another. At Gardner-Webb University, we join with our students in the unique, shared pursuit of life-changing experiences for God and humanity. At GWU, you’ll find a seamless blend of world-class academics within a nurturing, Christian community. You’ll discover that student-centeredness is woven into the fabric of every experience as you engage your heart, soul, mind, and strength in the purposes for which you were created. 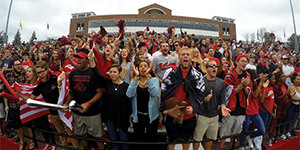 Being a student-centered university means that at Gardner-Webb, you won’t just be a bystander. 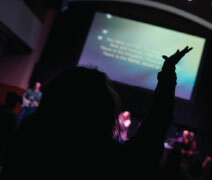 You’ll be empowered to engage in a genuine community—equipped, encouraged, and stretched outside of your comfort zone. After all, that’s where true growth takes place. The Gardner-Webb campus is friendly and busy. You won’t be able to walk across the Quad or into the Tucker Student Center without someone saying hello. You are also likely to encounter a Frisbee game, an impromptu picnic, an outdoor study session, a concert, or friends hanging out and enjoying the temperate North Carolina climate. With 60+ student clubs and organizations on campus, no matter your passion, you will discover new ways to enjoy longtime interests. At GWU, our goal is to help you ignite your purpose and passion within a diverse Christian community that embraces faith and intellectual freedom, balances conviction with compassion, and inspires a love of learning, service, and leadership. We believe that to be great leaders, we must first lead by serving others. Community service is a deeply entrenched priority in all we do as an institution. We are committed to helping you cultivate your unique talents and abilities and turn those passions into opportunities to make the world a better place. The world-class academic programs at Gardner-Webb are rooted in the liberal arts and designed to help you achieve your goals after graduation. Our faculty members are excellent at what they do. Our professors understand that ensuring your success means getting to know you—learning what drives you, how you learn best, and what you’re good at doing. Our faculty do more than just teach; they partner with you on your academic journey and help guide you every step of the way. GWU also provides other resources necessary for your success in the classroom, including LEAP peer tutoring, the Writing Center, and the Center for Personal and Professional Development, where you can seek one-on-one attention, have your term paper edited, or participate in mock interviews and résumé workshops. We understand the importance of outside-the-classroom learning. Whether through leadership opportunities in ROTC, a national Honors conference presentation, or a trip to Costa Rica to earn a Spanish minor, Gardner-Webb places a heavy emphasis on the tangible experiences that enhance your academic, professional, and personal pursuits. At Gardner-Webb, we are producing graduates who are living out their faith through service-focused leadership, impacting the world, and advancing the Kingdom of God through Christian higher education. To experience GWU, just pay us a visit. We’ll introduce you to your personal admission counselor, show you around campus, take you on a tour of the residence halls, and make sure you chat with plenty of students and faculty. Visiting campus is the best way to know if GWU could be your college home—you can schedule your visit at gardner-webb.edu/visit. We’re proud of the fact that—for more than 100 years—we’ve helped countless students ignite their future. Sure, our graduates are professionally successful; they’re bankers, missionaries, researchers, authors, and more. But they’re also great human beings. That is our greatest achievement. Ignite your future at Gardner-Webb University!